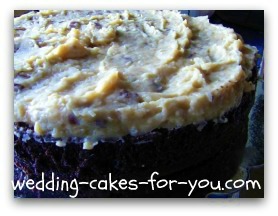 German chocolate cake icing is a cooked custard style frosting and or filling. 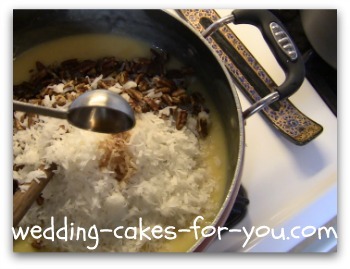 It is also known as coconut pecan icing and makes a delectable wedding cake filling. 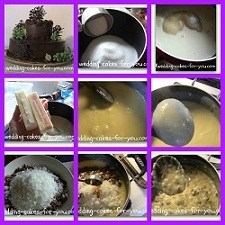 The two tiered cake in the video was for a birthday and was filled with this wonderful recipe. I also put the filling on the top of the six inch tier and then drizzled it with chocolate. The outer frosting is a chocolate ganache. The grapes were fresh picked moments before this shot was taken. They are grown at the family owned and operated White Silo Vineyards in Sherman Connecticut. 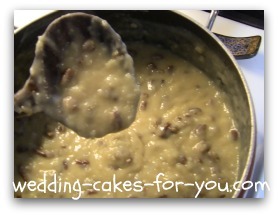 This cooked German chocolate cake icing can be used as a wedding cake filling or even a frosting for a very unique wedding cake. The coconut and pecans give this buttery icing a wonderful creamy and crunchy texture full of flavor. For the tutorial below I doubled the recipe above. This makes close to seven cups. In the demonstration I used a two layer 12 inch and a two layer 6 inch cake. This recipe multiplied by 2 filled both of them generously with 1 cup left over. 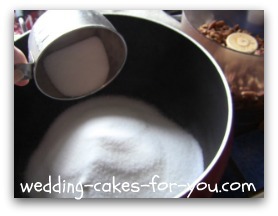 Start by adding 2 cups of sugar to a medium sized pot. 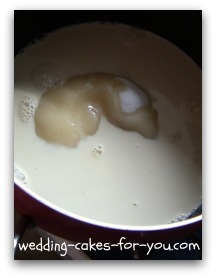 Next add 2 cups of evaporated milk to the sugar and stir. Evaporated milk can be found at your local grocery store. 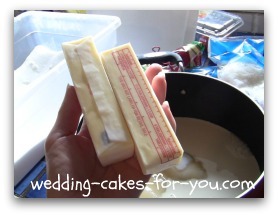 Add(16 ounces)two sticks of butter to the sugar and evaporated milk and stir over a low to medium to melt the butter. Lightly beat 6 eggs and add them to the warm mix of butter, evaporated milk and sugar. Stir until the mixture bubbles. When the custard coats the back of a wooden spoon it is ready for the coconut and pecans. Stir in 2 cups of chopped pecans and 2- 2/3 cups of coconut, plus 2 teaspoons of vanilla. Cover lightly and put into the refrigerator to cool and thicken. 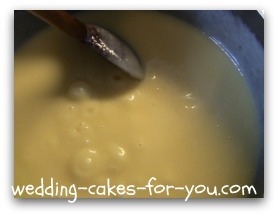 Once the mixture is cooled and thick it is ready for filling your cakes. 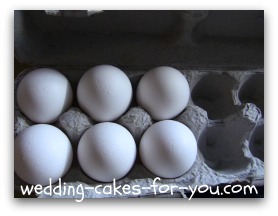 You can also use it on the outside of the cake as a frosting or as a decorative topping. The picture above is a 12 inch layer of chocolate buttermilk cake and a layer of German Chocolate Cake Icing. If you found this helpful please pass the good word. Thank you.